William H. Frey, Senior Fellow, at the Brookings Institution discusses the Uneven Aging and "Younging" of America as noted in the 2010 census. Due to baby boomers “aging in place,” the population age 45 and over grew 18 times as fast as the population under age 45 between 2000 and 2010. Although all parts of the nation are aging, there is a growing divide between areas that are experiencing gains or losses in their younger populations. There are far more charts, graphs, and analysis, in the Complete PDF The Uneven Aging and ‘Younging’ of America: State and Metropolitan Trends in the 2010 Census. The excerpts above were from a summary. During the past decade, the ranks of people who are middle-aged and older grew 18 times as fast as the population younger than 45, according to Brookings Institution demographer William Frey, who analyzed the 2010 Census data on age for his report, “The Uneven Aging and ‘Younging’ of America.” For the first time, they represent a majority of the nation’s voting-age population. Local governments are starting to grapple with the implications. “Clearly, the age wave is coming,” said Pat Herrity (R-Springfield), a county supervisor who heads the 50-plus committee. Although Florida and Arizona remain retirement magnets, 17 of the 25 states with the highest concentrations of senior citizens are cold-weather states. 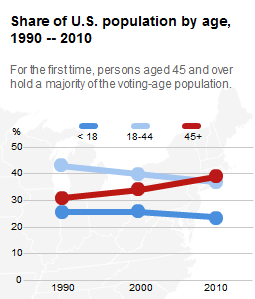 Older Americans now represent 53 percent of voting-age adults. “The political clout of older Americans will be even more magnified if the traditional higher turnout of this group continues, and as the competition for resources between the young and the old becomes more intense,” Frey writes. Ironically, older part-time workers remaining in or reentering the labor force will be cheaper to hire in many cases than younger workers. The reason is Boomers 65 and older will be covered by Medicare (as long as it lasts) and will not require as many benefits as will younger workers, especially those with families. In effect, Boomers will be competing with their children and grandchildren for jobs that in many cases do not pay living wages.